When word came down that Giles Goddard, the man who had a hand in creating such legendary game titles as Starfox and The Legend of Zelda: Ocarina of Time was creating a WiiWare title, speculation began growing as to what type of game it could actually be. So to say it was shocking when it was announced that the game was a rock climbing simulation would be somewhat of an understatement. But exactly how does a WiiWare title from this revered game developer stack up on the WiiWare service, and does it offer up a realistic enough gaming experience to be worth your hard-earned Wii Points? There are basically two different game modes in Rock n' Roll Climber. First there's the Challenge Mode, which allows you to take on the various rock climbing walls in the order of their difficulty. You'll be timed on each climb, as you make your way to the colored finishing block at the top of the wall. As you complete courses, you'll unlock newer and more difficult courses that can then be climbed. The other mode of play is the Free Climb Mode, where you can basically take a relaxing climb up any of the walls you've completed in the game's Challenge Mode. Strung around these walls you'll find special keys that will unlock even more new walls to climb. 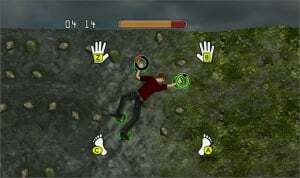 At the beginning of the game you're allowed to choose a rock climber to use, with two available at the start of the game, a male and a female, with other climbers unlocked later on. The female character is lighter in weight and is a bit more user-friendly for those who are new to the game, whereas the male character is a heavier climber and is geared more at advanced players. Once you've selected your character you'll then have to choose between two different methods of control. You can choose to use only the Wii Remote and Nunchuk controllers or you can go for the more authentic experience and add the Balance Board into the equation. If you are only using the Wii Remote and Nunchuk, you're going to be able to play the game, but you won't get the full experience without the Balance Board. What this means is that instead of using your feet, you're going to have to make further use of the two controllers in your hands in order to manipulate your feet movements. You basically hold your Wii Remote and Nunchuk out in front of you in a vertical position: to begin the climb you press and hold down the "B" and "Z" buttons on the Remote and Nunchuk respectively. Pressing these buttons will make your climber grab onto a hold on the rock wall; when you're ready to let go of a hold and reach for another one, you merely release the button on the hand you wish to move and then tilt the Wii Remote or Nunchuk in the direction you wish to reach. In order to make your climber move their feet, you're going to have to use the "A" and "C" buttons on the controllers. You're also going to have to tilt the two controllers back towards you if you want your climber to straighten their legs in order to reach holds that are slightly above your climber on the wall. For those who are going for the ultimate experience, you'll need the Wii Balance Board. 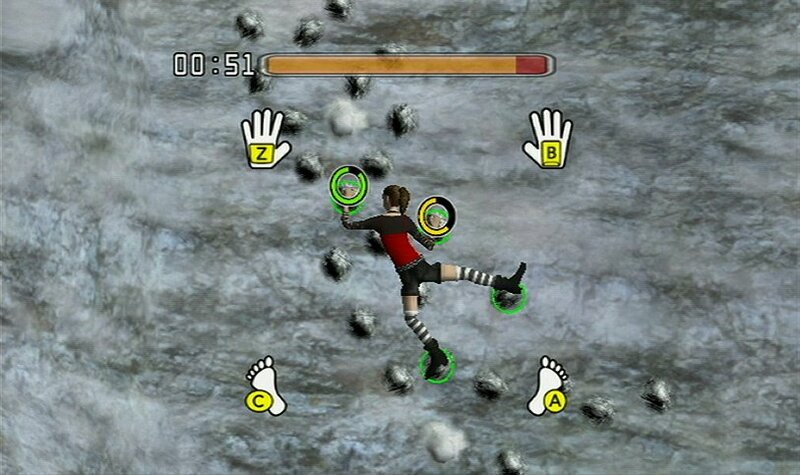 The controls for your climber's hands are basically identical to the Wii Remote and Nunchuk control method. Of course with the use of the Balance Board, you'll get to use your real feet to control your climber's foot movements onscreen. Shifting your weight to one side makes your climber pick up their opposite foot, and shifting your weight forward or backward influences how your climber reacts during the climb. Leaning your weight forward will make your climber straighten our their legs given you a better reach upward, whereas leaning your weight backward will cause your climber to bend their legs. Couple this with the tilting and moving back and forth of the Wii Remote and Nunchuk and you'll soon realize just how much freedom of control and movement you have over your climber. Of course it's this depth of movement that will take you some diligence in order to come to grips with it. As you climb the walls you'll have to keep your eyes on several gauges. For starters you'll have to constantly watch your Energy Gauge as this tells you how much energy your climber has left. The Energy Gauge is constantly decreasing as you climb the wall and will even decrease more rapidly during times when all of your limbs are not attached to a hold on the wall. If the gauge runs out before you reach the finishing hold, you'll fail the climb. You can replenish some of your Energy Gauge through the use of energy drinks: a yellow energy drink replenishes a little of your gauge and a red drink restores a larger portion of it. Of course there is also the individual Grip Gauges for each limb that you'll have to keep an eye on - these circular gauges let you know at all times how much strength you have left in each of your grips. If one of your Grip Gauges runs out, your limb will automatically let go. Needless to say it's very important to keep an eye on all of these gauges if you want to be successful during your climbs. As in-depth as the control system of the game is, the same cannot be said about the visual presentation. While it's not quite what you'd call bare bones, it's definitely in the neighborhood. The walls themselves are rather bland, although there's only so much you can do to spruce up a wall, but the backdrops in the game don't go far in adding anything flashy to the mix either, and even the rock climbers themselves show very little body detail. It's pretty clear that the developers focused the majority of their attention on the gameplay aspects of the game, which is a bit of shame considering that many of the stages lent themselves to some impressive backdrop scenery that's sadly nowhere to be found. The game might be called Rock n' Roll Climber, but there's actually very little rock n' roll found throughout the game. You're not even treated to a musical track during your climb, although the noisy crickets will sometimes be there to keep you company on those long climbs. You will get the much-appreciated little rock guitar jingle at the end of a long climb and in between walls, but it only makes you yearn for the music during the actual climbs all the more. Maybe the developers felt like the music might be a distraction for some, but it would have at least been nice to have the option of listening to the music during your climb. It's difficult to fault the developers for allowing players to have such a huge degree of control and movement during each climb, but with it comes a fairly large difficulty curve. It goes without saying that a trip or two through the game's tutorial is a must: there are just so many intricacies found within the control system that you'll need to familiarize yourself with before you dive into the Challenge Mode. How much enjoyment you ultimately syphon out of the game will depend on how patient you are and how willing you are to put in the time to learn the control system. For those who like to jump right into the thick of things, you might find yourself a bit overwhelmed, even early on in the game. While Rock n' Roll Climber is an interesting and rather realistic take on the rock climbing sport, its meticulous control system and sluggish pacing might prove to be a bit of a stumbling block for gamers looking to dive right in head first. 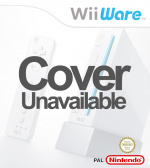 If you're willing to put in the time it takes to come to grips with the gameplay system, you're likely to find a gratifying and fairly realistic gaming experience that shows a lot of depth for a WiiWare release. At the very least it's a nice example of what can be done with the Balance Board when the time is taken to get it right. Rock n' Roll Climbing might not have a lot of added bells & whistles, but at its core it's still a fairly playable game for those who can appreciate what it brings to the table. Great review Corbie! Glad to see your working hard and sleeping well. I'm surprised that this game didn't knock you out, as it looks sleep inducing. 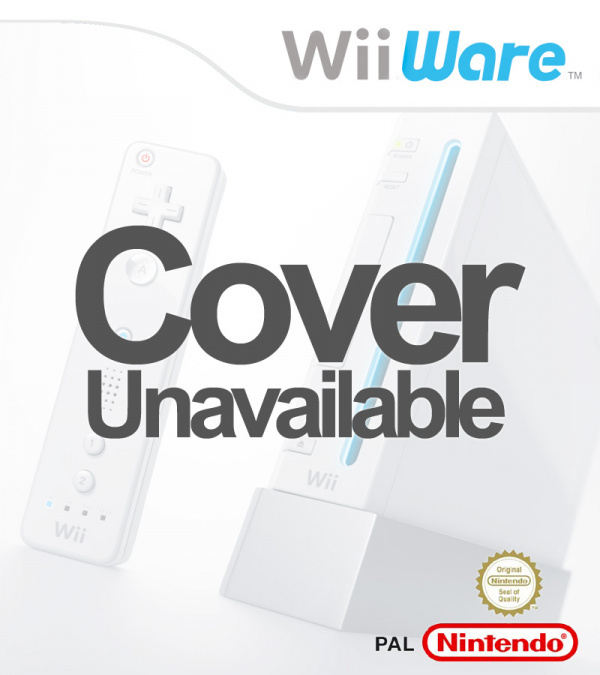 Looks to be another disappointing title. When I saw the title, I was hoping for some rock and roll treatment mixed with an acrobatic platformer kind of deal, but alas. Ah well. Great review Corbie! Great review Corbie, as usual. I thought this would get a around a 6 or 7 after seeing the gameplay videos by KS8. Still, I might pick it up in the future, could be an interesting experience. Wonder what they'll do next for a game. I wish they'd put a little bit of effort in with the visuals, there is quite a bit they could have done to make the walls look semi-realistic at least. As it stands it looks a bit yucky, and I think they've been lazy. Which is a shame because I've been dying to get my hands on a decent rock climbing sim. You have to give them credit for coming up with a unique theme for the game. No you dont. A game about going to the bathroom would be a unique theme for a game. Just because it's a unique idea dosent mean its a good idea.Not theat im saying rock climbing is a terrible idea for a video game, but if the game is a bore than whats the point? When I heard about it, I thought it would be a rock climbing game where the player would have to follow a rock rhythm to suceed. This game looks interesting but I'll pass this one. Great review Corbie! You covered the game brilliantly. Colour me pleased with your review. great review. I'll probably pass on it but it's an interesting premise for a game. Your right why would the developer try to something different like make a rock climbing game when they can always do another quick and easy poker and sudoku title Anyway according to the IGN review it says it's a bore to watch but more interesting once you play it. Great review as always the legendary Corbie! Well climbing rocks isn't my thing so I'll pass on this one. Hmm... looks a bit naff, to be honest. I'm considering grabbing this, but with 2 kids who are a constant threat to anything that takes time in my life I might have to give it a miss . It's awesome to see some unique ideas still coming from Giles though! What is this sleep thing people are always talking about? I actually really like the look of this one. 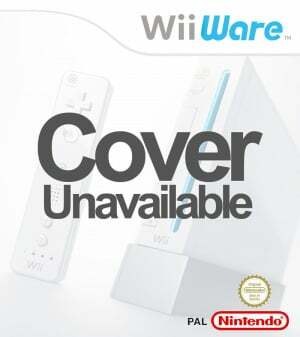 It looks different, which is what I love about the Wii (I have all three big boy machines) - different games. After having played the game I quite agree with the review although the score is too low. It's really a great game if you like climbing and the most realistic one too. I'd say, to anyone interested in this sport to give it a try. It's not as hard as the review seems to make it, and it's very satisfying when you reach the top of the harder walls. Have to agree with the above poster here. I had to give this a try since I received the Balance Board for Christmas. The learning curve for the basic controls is under ten minutes. The controls aren't perfect and it's hard to tell if I'm really getting it or just getting lucky. Though if your movements are precise all your limbs move quickly and smoothly along the wall. Also the pace I find is not slow at all, it's actually very engrossing and a bit of a challenge.